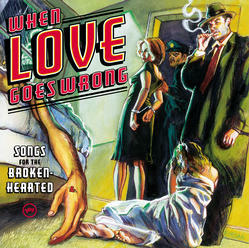 Just as you were sitting there anticipating either the joys or anxiety of Valentine’s Day, Verve Records comes out with a compilation of the love songs for the forlorn entitled “When Love Goes Wrong: Songs for the Broken-Hearted.” This album features fifteen of the most thoroughly depressing songs ever recorded collected on one special CD. Throw in Aretha Franklin’s “Drinking Again” and you could call it, “Drinking Music – The Sequel.” I have a love for this kind of music but I could never quite figure out why especially since I don’t drink. Somebody pass me a bottle of Seagrams and the Krispy Kremes!! This entry was posted on Sunday, February 9th, 2003 at 7:40 am. It is filed under Music Reviews. You can follow any responses to this entry through the RSS 2.0 feed.